How Traditional is Modern Tenkara? “Traditional Japanese Fly Fishing”. That’s the tag line of this site. But lately, I’ve been wondering how accurate that line really is. In terms of the tackle we use, there seems to be nothing that is really “traditional” about it. Early tenkara anglers fished with bamboo rods, lines, and hooks fashioned from needles. Today, we fish with high tech carbon rods, fluorocarbon lines, and chemically sharpened hooks. Perhaps our flies are the closest thing to being traditional that we use, but even that could be called into question when you consider that early tenkara tiers used locally available, found materials whereas we have access to an industry that produces prefabricated materials for us in a nearly infinite array of colors and sizes (not to mention all manner of sophisticated tools to tie them). So, at first glance, it seems our tackle isn’t very traditional. But what about our form? 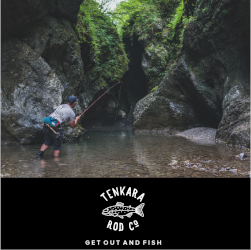 As happens with any cultural import, tenkara has been blended with our western fly fishing traditions. While there are some who adhere to more traditional methods, I think the vast majority of anglers use tenkara rods, but with western techniques and flies. Could this hybrid tenkara still be called traditional? There’s only one way to find out: go back in time. Imagine we built a time machine and brought a modern day tenkara outfit back to 18th century Japan (I knew that Flux Capacitor I’ve had sitting in the the garage for the last 5 years would come in handy some day). We hike into a remote mountain village and comb the local stream to find one of our tenkara forefathers. We hand him the rod and wait for his reaction. Immediately, he is struck by the sleek materials and inspects them meticulously, trying to figure out what they are. They’re alien looking, but he is mesmerized. Then, he takes a cast. He’s amazed by the lightness of the rod and how well the incredibly thin line turns over. A big smile comes over his face. He knows this is a far superior fishing tool than his handmade bamboo rod and horsehair line. He can do all the same presentations with it he always does—only better. The rod is so light, he could fish all day with it and not get tired. And the line seems unbreakable. No more wasted time repairing broken lines every evening! Suddenly, a flood of images comes to his mind—baskets upon baskets of fish he could catch with this rod. But it’s interrupted by a sudden fear: “Are these strange people giving me the rod to keep or are they going to take it back?” If he could keep the rod, surely he would outfish all the others and be able to provide more for his family. Involuntarily, his hand tightens on the grip in apprehension. Now, we step back into the time machine with our new friend and bring him to a modern day stream. He sees anglers using the same magical rods he just discovered yet something is different. Some of the flies look familiar, but they’re all sorts of colors he’s never seen before. He wonders, “do they have pink chickens in the future?” Some even have gold balls at the head, while others are made of some squishy material that floats perfectly on the surface. They don’t look like the flies he ties at all. He sees some anglers applying some kind of paste to their flies, while others have large, bright beacons that float on the surface with small stones below it to help sink the fly. Altogether, this looks very different from his way of fishing and he becomes very confused (and a little curious) about all of these strange techniques. Einstein conducted a lot of so called “thought experiments”. To form many of his theories, he often didn’t even write down one formula on a piece of paper or use any of those weird antennae looking things with the blue electrical waves undulating between them. He literally carried out the entire experiment in his head. Since we can’t actually go back in time, this is my thought experiment on traditioanl tenkara. I feel that modern day tenkara rods would be recognizable as tenkara rods by early anglers (they’d just see them as better), but hybrid techniques would look like something altogether different. I don’t think they would discount them—but they certainly wouldn’t identify with them. So, ironically, I think the high tech tenkara rods and lines we use today are actually more traditional in spirit than the hybrid techniques that are often used with them. However, if one used a modern day rod with, say, one sakasa kebari, then I think a tenkara angler from the 18th century would have no problem recognizing it as tenkara. So for me, the answer is that our own modern version of tenkara can be as traditional as we want it to be. But that raises another question: Does it matter? This really seems like a stretch to me Jason. Why would entirely different rods and lines seem in the same vein, yet an “improved” (arguably) fly strike them as something altogether different? I mean, a bead head fly is way closer to a sakasa kebari than a telescoping graphite rod and fluorocarbon lines are to bamboo and horse hair. They didn’t use graphite because they didn’t have it. The didn’t use a tungsten bead because they didn’t have it. Of course I don’t know if they would have used tungsten if they had it. 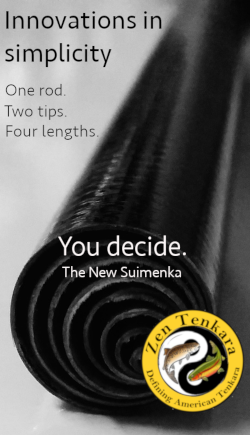 But it seems completely arbitrary to decide that the fly is what defines traditional tenkara. My guess is that they would have used spinning rods and spoons if they had them – they made their living that way, “purity” was probably low on the priority list. I would concede that the fly is the most traditional aspect left in tenkara today. But I don’t buy the idea of of a traditional tenkara fisherman drawing the mental line at the fly. It seems entirely arbitrary. Though I disagree with you, my response is meant entirely in the spirit of good discussion. I appreciate your point of view. I like what you wrote, it is your thoughts and that’s why I am reading here. We are practicing modern Tenkara, traditional Japanese fly fishing. I am not a politically correct angler. I have to agree with Mike here. I mean I’m sure that the flies would look different but I think seeing a 14 foot rod collapse into itself would be a lot more impressive. To your point, have we Americanized tenkara too much? I think not. I mean if that Japanese anglers had access to carbon fiber rods that could collapse I’m sure that they would have chosen that over bamboo. The same can be said for lines and tying material. We are lucky to live at a time when we have a vast network and materials to engineer with and I think that is just the evolution of it all. 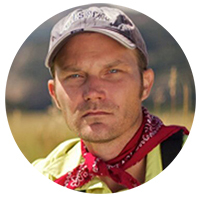 I enjoy learning about and fishing tenkara because it is where fly fishing comes from and I like learning the history of the sport I am passionate about. With that said its also a challenge and fun to get back to the simplicity of it all. Interesting “thought experiment” and logic. I have tried to stay away from the term “traditional” as much as possible because it brings up the “what is traditional”, and sure enough we are not using “traditional” equipment made of bamboo and horse-hair. 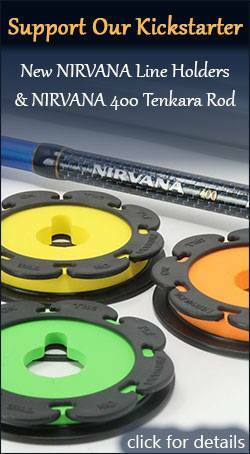 Contrary to what some will claim, I never said the equipment is what defines tenkara (though I have talked about different equipment being designed with different purposes in mind). Thus, I like the logic or asking what would be recognizable as tenkara. If you want to limit the discussion to technology, rather than the techniques or the reasons we go tenkara fishing, I would say it is traditional to use the best materials available for the rod,line, and kebari. Why do I say this? I read a story several years ago about a Canadian museum that hired an Inuit elder, living in a remote village, to build a traditional kayak for them. He was one the last people living who still knew how a kayak was built in the traditional way. When he completed the kayak he was pleased with the result. But, the museum people were not pleased because the elder had used bits of plastic or HDPE in places where kayaks collected in the 17th, 18th or 19th century had used bone or ivory. To the museum people the kayak was not traditional. But in the mind of the village elder the kayak was quite traditional because he used the best materials he could find in the village to build the kayak. He was confused about why the people from the museum wanted him to rebuild the kayak using bone and ivory, which he believed were inferior materials to the materials he had used. And the traditional way to his way of thinking was to use the best materials that could find in the local environment. The rest of the material used where seal skins and wood split from a log that he found on the shore. Therefore I would agree that our tenkara gear would be seen as traditional during a stop in the 17th century on Jason’s magic time traveling bus. Though also looked at in amazement due to its lightness and durability. However, the 17th century tenkara fisherman might be mystified about our reasons for fishing. He might even agree with some modern techniques and experimenting with techniques different from his own. But would most certainly shake his head at our foolishness of C&R. A very non-traditional act. I think the biggest difference is the mindset of recreation versus vocation. Early tenkara anglers may well have loved to fish, but they might not have loved it everyday they had to go out, through sickness, injuries, family tragedies, etc. At the end of the day, they had to carry a heavy basket of fish back to the village, no matter how much their feet or backs hurt. If they didn’t have the heavy basket, it cost them money and the ability to provide for their family. That’s a big difference between what we experience when we head out, or choose not to. I didn’t really limit it to the fly, rather the rigging techniques of using strike indicators, split shot, floatant, etc. I think these techniques would indeed seem strange to a traditional tenkara angler. And nowhere did I say tenkara has been too Americanized. I’m merely pointing out that I don’t think they way we fish today can be called “traditional”. Great point about using the best materials available. That’s why I was imagining that the early tenkara angler wouldn’t want to give up that magical rod from the future. I agree. Fishing for recreation would probably seem ridiculous to someone whose livelihood depends on it. Can you imagine their reaction if they saw us catch a fish and then release it back into the water? They’d probably think we were insane! Great post! As for the hybridized techniques, I call them “Western Tenkara”. I suppose fly patterns could be included in what I consider Western Tenkara, i.e., terrestrials. GoreTex jackets and waders, the list just keeps going. Unless you want to wear your best wool tweeds, a 10ft bamboo rod and a click/pawl reel loaded up with silk line, you are not traditionally western fly fishing. anyways, yeah, good stuff jason. thanks for sharing your thought experiment with us. Fair enough Jason. I took it that you were saying that flies tied with newer materials would be the line and that seemed to contradict your stance on new materials for rods and lines. I’d agree that floating an expoxied brassie under a thingamabobber would seem in a different category to someone brought from the past. Speaking of bringing people from the past – I’d love to see Mark Cathey fish a tenkara rod. I think he’d have loved it. He was the king of fly manipulation (thought dry, not wet). The Tuck Reader went offline, but Jim Casada had written several very good articles about Mark. Perhaps “traditional” isn’t the right word but how picky do we wish to be? I learned to fish with a bobber and bamboo pole. Progressed to a closed face reel and then to spinners. A few years ago I moved to a place where I was privileged to be able to learn to fly fish on moving water. What a change! I only recently heard about tenkara and love the concept. I tie my own flies and build the rods (don’t think tenkara rods are in the mix) but the gear isn’t the motivation. I no longer count the fish that I catch as it doesn’t matter. It’s the nature, the river, and the peace of mind. That’s the tradition for me. Your blog line, “traditional Japanese flyfishing” is fine. I know where you are coming from and my research reaches deep into Tenkara independent of Daniel’s excellent exposure of it. The rod company that I work with is certified by the Japanese government to be “traditional Japanese craft” and those Tenkara rods are nesting bamboo rods as well as modern nesting graphite examples. Tradition is also about where the form came from, we are practicing tradition now. I really like what we discussed in your interview, I think you get it just like you list others that get it. You are contributing without a doubt. Thanks Adam. I was thinking of changing it to “fixed line fly fishing” but that sounds boring and I like the idea of keeping Japan in there so maybe ill just leave it as it is. +1 on the ‘thought experiment;’ the diversity of topics on this website is great. Looking forward to more. I have a question regarding rod-tip action and which is closer to traditional action of bamboo: the ‘softer’ solid carbon tip segments used by TenkaraUSA, or the ‘faster’ hollow-tip segments used in many of the Shimano and Daiwa rods. I’ve read that the hollow-tip segments turn over a ‘modern’ level-line better than the solid carbon tips which look softer in many of Chris Stewart’s (Tenkarabum) great penny-weight photos. 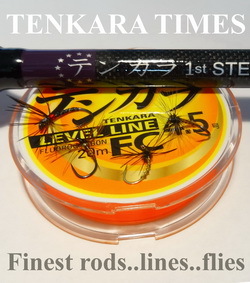 So could we generalize that many Japanese companies are making tenkara rods better suited for the most ‘modern’ line type (level fluro), and the American company is slightly more ‘traditional’ in making rods with softer tip segments that cast furled lines beautifully? 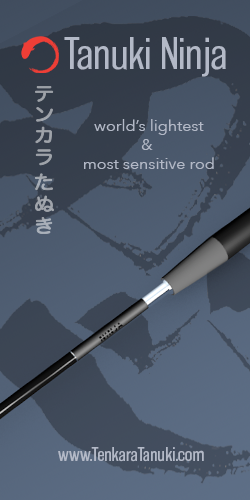 Will TenkaraUSA make a rod model with hollow tip-segments anytime soon? Thanks Kevin. I’ve only cast one rod with a hollow tip so maybe someone here with more experience can chime in. To me, solid tip rods cast level lines just fine. No I don’t believe we are true tenkara anglers. I love a rod without a real. Especially a rod that has reach. A rose by another name doesn’t apply here. We’re just posing, the root of this style of angling, is they had to eat and provide. p.s. i also think that “traditional Japanese flyfishing” is a perfect tag. tradition being what it is, is it not then tradition for anglers of all ilks to tinker, to simplify, then tinker and simplify some more. at the same time, it is tradition for anglers to decry the techniques others endorse only to take up those techniques at another time. i reckon then that tradition is in the eye of the beholder. as for the question, “does it matter?” it may, but then again maybe not. I think it is important to remember that the dichotomy between “tradition” and “modernity” is, in many ways, a fundamentally Western concept. If you’ll permit me a historical generalization, Western modes of thinking have long tended to emphasize binary oppositions that aren’t necessarily recognized in other parts of the world. In particular, the notion of “authenticity” in the face of modern advancements has been a subject of heated debate in discourses about music and practically every other Western art form. Now, I must admit that I’m no expert in Japanese culture. But if a person takes a stroll down a modern Tokyo street, they will be surrounded by state-of-the-art technology and architecture and all the other trappings of a modern capitalist society; yet, while they’re walking, they might pass someone wearing a traditional kimono and powder-white makeup that looks like they just stepped out of a time machine. According to my understanding of Japanese philosophy and aesthetics, this striking juxtaposition between the “traditional” and the “modern” — something you see repeatedly in Japanese arts and culture — offers no fundamental contradiction. When viewed in this light, I don’t see anything particularly “Western” about the recent innovations in tenkara gear and fishing techniques. In fact, throughout much of Japanese history people in Japan have enthusiastically imported cultural elements from other countries and reinvented them according to Japanese aesthetic principles. At the close of the Edo period (the notable exception to this rule), a popular phrase arose to describe this renewed propensity for adaptation: waken yosai (roughly translated as “Japanese spirit and Western techniques”). Even today, Japanese culture is replete with examples of elements that have been appropriated from elsewhere. The way I see it, Western adaptations of tenkara philosophy and gear seem to follow precisely this same tendency. Going a step further, you could even argue that there is nothing MORE Japanese about tenkara than the process of adaptation it has seen in the hands of Western anglers. I apologize for writing a minor essay in your comments section. 🙂 This conversation is just too much fun to have! It’s one of the things I love about the tenkara community. Excellent insight Chase! I witnessed the same thing in Japan, China, and Thailand. Lots of seeming anachronisms like Internet cafes right next to 1,000 year old monasteries. Very interesting to see. My Tenkara knowledge base line started in 2007 during a trip to Japan. I noticed fishermen with long rods and thought they were dapping. Had to have a long one and bought a 17 footer not knowing anything about what they were doing or even knowing it was called Tenkara. Being too unwieldly I pretty much put it away until I ran across an article about Tenkara USA and realized what I had and sent away for a Yamame and pretty much put away the fly rod because of the simplicity. I think I picked it up at the beginning of a Tenkara evolution. Soon I could not keep up with all the changes and had to try all the new stuff I was being introduced to and finally, it became overwhelming trying to keep up with the latest and greatest. Kind of back to the reel with some Tenkara still going on. Is all the Tenkara transformation happening in Japan too or is it Americans trying to make a simple thing too technical and over the top? I often say, when starting a simple project and as is common, as often as not, it turns into a big job, ” Is nothing simple anymore”. Thanks Jason for a fine blog post to make us all think more on this nice Friday afternoon. What we need here is a Tardis! Yes fellow Whovians?! I had the pleasure to know somebody that around the middle of 20th century used to sell trouts fished with valsesian system, As an addon to their wage. I don’t see where everyone can just concede that an old Japanese man up on a mountain would just drop his bamboo pole to pick up a graphite rod. I have both and I actually use the cane pole more often than I do the telescoping rod. And as far as somehow being able to catch more fish because you have a carbon fiber rod, that is a stretch. I also find a Tardis preferable to a flux capacitor. It’s just way more efficient. But other than that, this is an interesting article. It inspires thought.